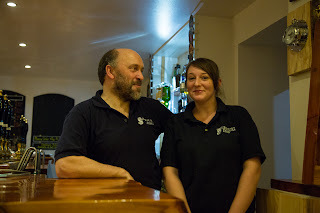 I have been an infrequent but regular visitor to Glenuig Inn since the late seventies, when we arrived by yacht. The Glen Uig Inn is situated in the heart of one of the finest sea kayaking areas in the UK. Within a short distance there are sheltered waters with white sand beaches and ancient castles, exposed headlands, deep sea lochs and offshore islands which can be reached by ferry or committing open crossings. This was my first visit since 2008, when it was renovated, and I was unsure what to expect of the new Glenuig Inn as Tripadvisor reviews are polarised. I am pleased to say we were not disappointed. On my first visit to the new Inn we were a party of five sea kayakers (including my adult daughter). We stayed 3 nights and ate in on each occasion. We received a warm welcome from the owner Steve Macfarlane. The comfortable spacious rooms are in a matching building beside the hotel itself. Each room had a practical large entrance vestibule where luggage, wet coats, boots etc. could be left. The room was very cosy and warm. The floor was laminate, which I prefer to a carpet in a hotel room. The beds were comfortable. There was a kettle, hair dryer and small TV in the room. The bathroom was spotless with bath and thermostatic shower with plenty of hot water. There is a drying room for wet outdoor gear situated at the far end of the room block. Liquid soap is provided but not hair conditioners etc. We also inspected the bunkhouse which is upstairs from the dining room. There are 10 proper single beds and two WC/shower rooms. There is also a small room with a sink and kettle for making hot drinks. The lounge, bar and dining room were heated by stoves that burned compressed sawdust and wood shaving "logs" from the mill at nearby Corpach and kept the hotel feeling very cosy. The bright lighting is by LED low power bulbs. There are no carpets so well behaved dogs, sea kayakers and hill walkers in wet gear will not be turned away.Free WiFi was available in public rooms. There was a good O2 2G signal outside the hotel. Owner Steve and chef Amy at the bar. We were delighted to find three Cairngorm Brewery real ales on draught and were told 4 additional pumps with other varieties were available in the summer season. Note that the bar does not stock lager and lime or sell salt and vinegar crisps. If these are your forte, stop off at the Lochailort Inn further back up the road (though on my last visit there, on Saturday 20th September 2008, we were unable to get service for food, coffee or even a beer at lunchtime). Several regular Tripadvisor contributors have made negative comments about Glenuig Inn not serving keg lager but it is advertised as a real ale only pub. You don't buy a petrol car then expect to put diesel in it! The meals were superb, made from nutritious ingredients, some very local like the prawns tails from Mallaig and home baked bread. 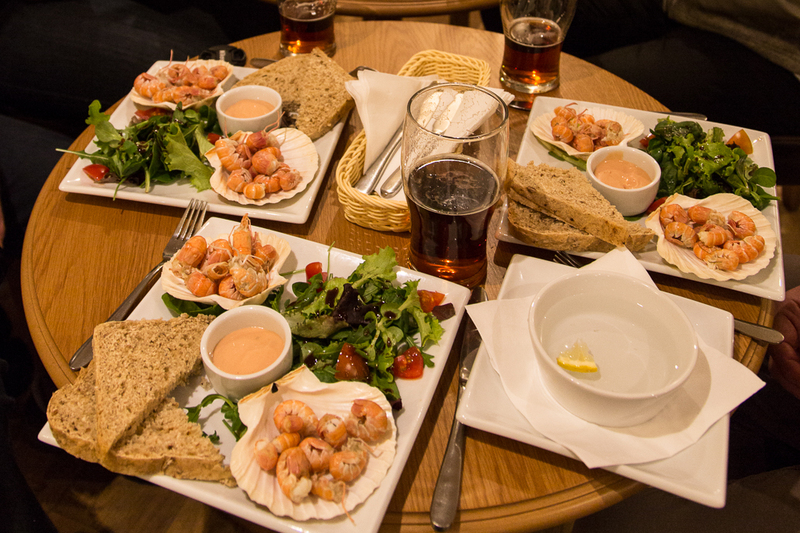 We can recommend the prawn tail and Moroccan mezze starters and the salmon fillet with salsa sauce (especially tasty), lamb tagine and steak and ale pie mains. 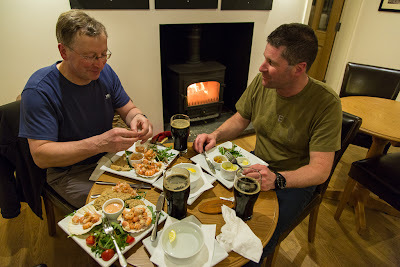 Despite sea kayaking each day and coming in feeling ravenous, we were totally filled by a starter and main course. We tried the spiced apple and ice cream on a later visit and it was delicious. Salad accompaniments were very fresh and served with balsamic vinegar. Breakfast included several fruit juices, muesli, cereals, home made bread, fresh fruit and berry salad and a choice of pancakes (with bananas and maple syrup) porridge, kippers or scrambled egg (with smoked salmon and especially tasty). Coffee was made from grounds and filtered and was excellent. It was good to see that food was served continuously between 12 mid day and 9pm. We were late off the water on two evenings and this was not a problem. I remember the Old Glenuig Inn stopped serving lunch at 1:30pm (and for those nostalgic for the former inn, their idea of salad was a can of Heinz mixed salad). The Glenuig Inn is situated in the heart of one of the finest parts of the west coast of Scotland for those that like the outdoors and wonderful scenery. The beautiful white shell sand beach with offshore island at Samalaman is a short walk away and we launched our sea kayaks from the hotel though at low tide there is a bit of a walk and a trolley would be a good idea if you were staying. If you have a car and it is low tide then an alternative launch site would be Samalaman beach. 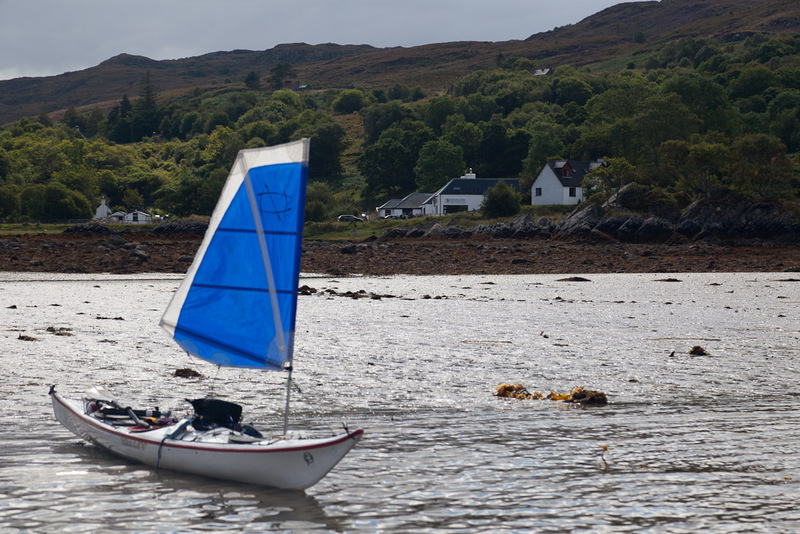 For those sea kayakers who would like a guided trip or coaching Steve Macfarlane also runs Sea-kayak Arisaig. As we have kayaked independently on our three visits I cannot comment on this side of the business. However, I met a young couple (who were not novices but relative newcomers) at the Perth Canoe show in 2012 who spoke very highly of their experience during summer 2012. On two of our stays we left a shuttle vehicle at remote locations in the Ardnamurchan area for several days. 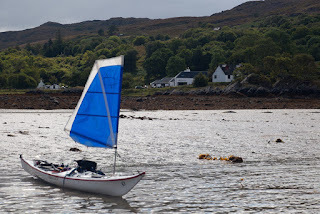 It was reassuring not to create local concern by being able to put a card in the car window: "Seakayaking in the area, float plan left at Glenuig Inn, tel no. 01687 470219". The Glenuig Inn is not part of a bland international chain of hotels, designed and managed by a committee. It is one man's vision of what a small highland hotel should be and as such it may not be to everyone's taste. However, the Glenuig Inn is a very welcome addition to the West Coast of Scotland. It gives a real choice that rises above the mediocrity that Scotland has often been associated with. I rate it as highly in its price sector as other outstanding Scottish hotels, B&Bs and bunkhouses are in theirs. For comparison I have recently stayed in: Gleneagles, One Devonshire Gardens, Knockinaam Lodge, Toravaig House, Broadbay House, Garleton Lodge, Lageorna, Kinloch Castle Hostel and Muck Bunkhouse. I have returned twice on further sea kayaking trips since my first visit and I intend to return shortly with my wife for a family visit. I would never have stayed in the Old Glenuig Inn. To those that hanker after the Old Inn (with its dark interior, windows dripping condensation and grease, Tennent's lager and lime, fish and chips with mushy peas, wet floored toilets smelling of urine etc), why not save yourself a drive and stop off at the public bar at the Clachaig Inn in Glencoe? It too is very good at what it does. Thank goodness for increasing choice in Scotland.